Disappointment for our Senior Hurlers who lost out by the smallest of margins to Ballyboden, next round fixture has been set and the play Setanta in O’Toole Park on Good Friday. 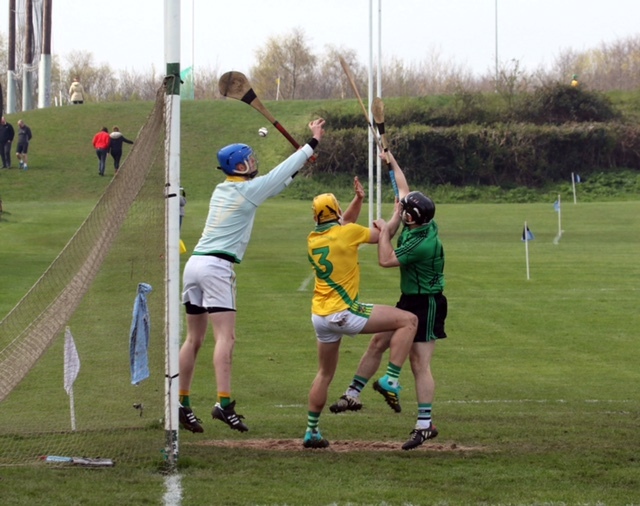 Jnr A hurlers drew away in Faughs, and the Jnr B’s had an impressive win at home to Wild Geese. Good wins for our first and third Minor football teams, both our U15 football teams won their opening Championship games. Good wins also for Minor Ladies Football, U15B LF, Inter1 Camogie, U16A football. Hard luck to our U14A Ladies football team who put in a great shift but unfortunately came up short, away to Ballyboden in Div 1, a gutsy performance, and while the team are finding it tough in Div1 they continued hard work ethic is great. Disappointment also for our Senior Camogie who lost out in the league to a strong St Vincents side. This weekend is a very busy weekend, we open with our Senior footballers Championship first round game, 7.30pm in Garristown vs Skerries Harps, a massive game and we are hoping for big support. We then move to Féile Hurling weekend and we have two teams entered, D1 and D5, best of luck to both teams, we are hosting D1 so the club will be buzzing and we hope you can get up and support the lads. The D5 is being hosted in Pearse Park, Crumlin, support very much appreciated and welcome. Our Inter footballers also play Championship on the Saturday away to Cuala, 6pm, both Jnr teams are at home in Championship opening fixtures on the Sunday at 11am and 3pm. Lotto There was no winner of the lotto on the 4th April, Numbers were 3, 7, 13 and 18 . Next weeks’ jackpot €3,800, and we will also raffle some Easter Eggs the draw will be managed by Gerry McAndrew and is sponsored by Coláiste Laichtín, Inis Óirr. Lucky Dips Winners: Teresa Dunphy, Declan Lee, Geoffrey Brennan, CeeanDee, Toni Russell. Play Online here, Or Tickets can be purchased at the Club, or in Kenny’s Vesey Arms. Lucan Sarsfields Golf Society's first outing of 2019 takes place in Kilcock Golf Club this Saturday 13th April. Limited spaces still available but contact Seamus as soon as possible if interested. Seamus Fagan at 086 8168984. Lucan Sarsfields Disco 4th 5th and 6th Class Disco Friday 19th April; 7.30 pm – 9.30 pm (Supervised). This will be a ticketed event and tickets are on sale in the bar. Club Shop is open Saturdays 10.30am to 1pm. However it will not be open Easter Saturday. 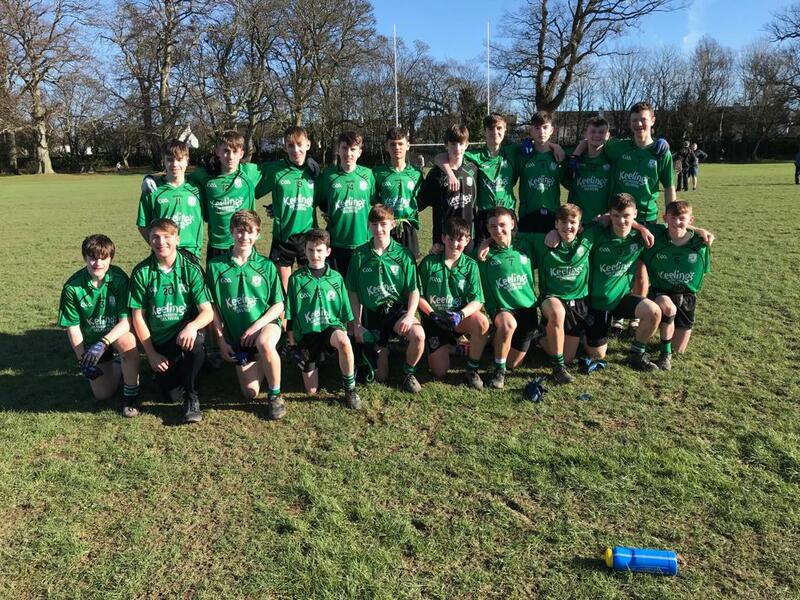 Pride of place goes to both of the Lucan U-15 football teams this weekend who were in championship action this Sunday and who both recorded very good victories. Something serious seems to have clicked with this Lucan team over the last 6 weeks although the makings of it could be seen happening bit by bit for a long time before that. Lucan have played Fingallians four times over the last two years and have never been on the right side of the scoreline at the end. A true team performance from 1 to 21 made sure that Lucan prevailed this time. Squad: Alex Kelly, Cian Tracey, Matthew Ryan, Fionn Buckley, Liam Farrell, Jack Kelly, James Ryan, Conor O'Neill (0-02), Matthew Byrne (0-01), Donohoe (0-01), Niall Higgins (0-03), Jack Langan (1-00), Andrew Kennedy, Andrew Glynn (0-01), Tommy Mulhall (1(P)-06(5F)), Adam Bonass, Ross Campion (1-01), James Moloney, Cian Cregg, Ronan MacCraith and Dara Moran. Championship Sunday and with the weather and the conditions indicating that a good game of football was to be played; the players duly obliged. Having lost the opening game of the season to St Judes, Lucan were determined that the result was not going to be repeated. Playing against the breeze in the first half, Lucan defended well and broke with purpose on each occasion. Despite only having about 30% of the play Lucan went in at half time 3-04 to 0-08 up courtesy of some fine scores all delivered following great hustle to break up the St Judes attack. In the second half, Lucan were a bit edgy for the first 10 minutes, but then hit a purple patch slotting over some fine long range scores. A goal for St Judes 9 minutes from the end put Lucan under a small bit of pressure but calm heads prevailed as Lucan tacked on two insurance points to round out the game with a 3-11 to 1-12 victory. On Friday evening, the U-13A team competed in the Division 2 Grading league. After being ahead for the majority of the game, Lucan conceded a late goal and point to ensure the game finished in a well contested draw, Lucan 4-05, Ballinteer St. Johns 3-08. On Saturday, both of the other U-13 teams were in grading league action. A game of two halves in a high scoring contest resulted in a draw in Game 6 of the Grading League. Lucan lead 3-11 to 1-03 at the break and looked to be in control of the game. However, the switch of ends proved pivotal with both teams benefitting from a subtle breeze that had a big impact on scoring. Lucan in the first half playing with the advantage of the breeze amassed a tally of 20 points, while O’Dwyers managed 19 points after the half time turnaround. Lucan were under immense pressure in the second half but showed great attitude to hold out for a draw in a tough encounter with a team that had played some of their games in the age level above (u14) before switching back to the u13 level. Lucan have one more game to play in the Grading League, away to Ballyboden on 27th April. Squad: Conor Dolan, Shane Dolan, Alex Keegan, James Scott, Sean Treanor, Ryan Feighery, Eoghan O’Connor, Mark Deignan, Rory Egan, Dylan Carr, Michael Lynch, Callum Wynne, Adam Salmon, Ben O Keeffe,Oisin Sharkey, Aaron Cronin. Another sunny afternoon welcomed Skerries Harps to Lucan.The visitors went into the customary early lead and were on top for the first 10 minutes before Lucan gathered themselves and got back into the game. Lucan went on the attack and a scoring spree for the rest of the game resulted in a great win for this team.The team welcomed back H Geoghegan and O Corry from injury both played well and didn’t show any signs of the injuries which had kept them out of recent games. 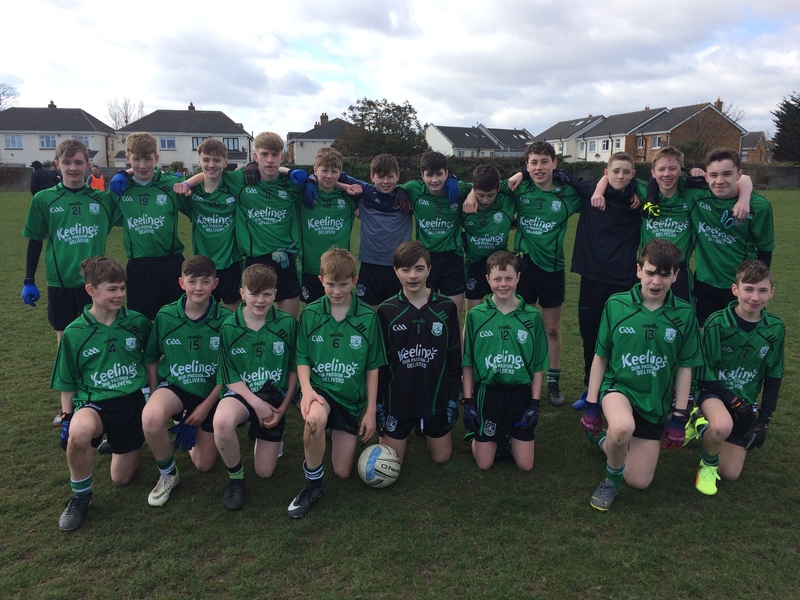 On Thursday evening the U-14A footballers were in Division 1 league action. Lucan hosted St Sylvester’s in a re-arranged fixture on Thursday evening last. Played in very wet underfoot conditions both teams managed to serve up a very competitive and entertaining game of football. Lucan raced into a 5-point lead when Daragh Lyons burst through from centre-field to finish to the net. Liam Brennan and Alex Derrien popped up with points and frees from Adam Burns and Cillian Whelan kept the scoreboard kicking over. Just before the break a fine move was finished to the net from an acute angle by full forward Cormac Coffey to mean Sarsfield’s led by 6 at halftime. Score 2-07 to 1-04.Lucan came under a lot of pressure after the resumption, but the defence was strong and Sean Carolan, Darragh O’Toole, Conor Greally and Daragh Walsh were on hand to mop up most of the danger. Sarsfield’s managed some good scores on the counter helped by Ryan Clancy and Dan Kane’s running from defence. Midfielder Sean Langton popped with up to 2 goals to give Lucan a cushion and further points from Paddy Ryan and Adam Burns sealed the result. Sylvester’s made a late push but Cathal Kennedy now operating at full back made a number of fine high catches to snuff out the danger. Subs: Darragh Meehan, Kevin Hegarty, Dillon Ryan. Scorers: Sean Langton 2-00, Daragh Lyons 1-01, Cormac Coffey 1-01, Adam Burns 0-04, Cillian Whelan 0-02, Liam Brennan, Paddy Ryan and Alex Derrien 0-01 each. The other two U-14 teams were in league action on Saturday. In the U-14 Football Division 5 football league, Lucan had a great win against St. Maurs on a scoreline of 3-09 to 1-05. Match Report: A 15 man Lucan squad hosted an impressive O’Dwyers team that have been going from strength in this league. Lucan had the better of the earlier exchanges and a powerful run from Daniel Byrne towards the senior pitch end goal led to the opening point of the match by Daniel Mahon. Both sides were awarded a penalty each in the first half which they converted and although behind by 1-1 to 2-3 at half time, Lucan were hopeful they could overturn this deficit in the second half. O’Dwyers started the second half strongly and had scored an unanswered 1-3 within the first ten minutes. Following the switch of Ryan Donnelly from corner back to centre forward Lucan began to find their scoring rhythm once more. Lucan players fought to the end and highlights of the second half included some great saves from goal keeper Sean Kearney, solid full back play from Cian O Driscoll and two long range points from mid fielder Oran Fitton. O‘Dwyers had some very good players and that, along with their fresher legs allowed them see the game out to the end however. Squad: Sean Kearney, Cian Nohilly, Cian O’Driscoll, Ryan Donnelly Ronan Munnelly, Sean McGowan, James Kearney, Oran Fitton, Jasper Nolan, Conor Smullen, Cian Maher, Callum Norman, Daniel Mahon, Daniel Byrne, Sean Teehan. Both U-16 teams were also in league action on Saturday. Lucan began the first half playing uphill and into the breeze, but made a blistering start to score a few early goals. Mearnóg had a good spell in the middle of the first half but Lucan finished strongly to lead 4-7 to 1-5 at half time. Lucan began the second half as we did the first, playing some great direct football from goalie out through defence into the forwards and continued to score heavily throughout the half. Mearnóg began to tire as the second half progressed and Lucan finished the game with a couple of further of scores to run out winners by 8-17 to 1-6. A great squad performance with everyone contributing to a well-deserved win. 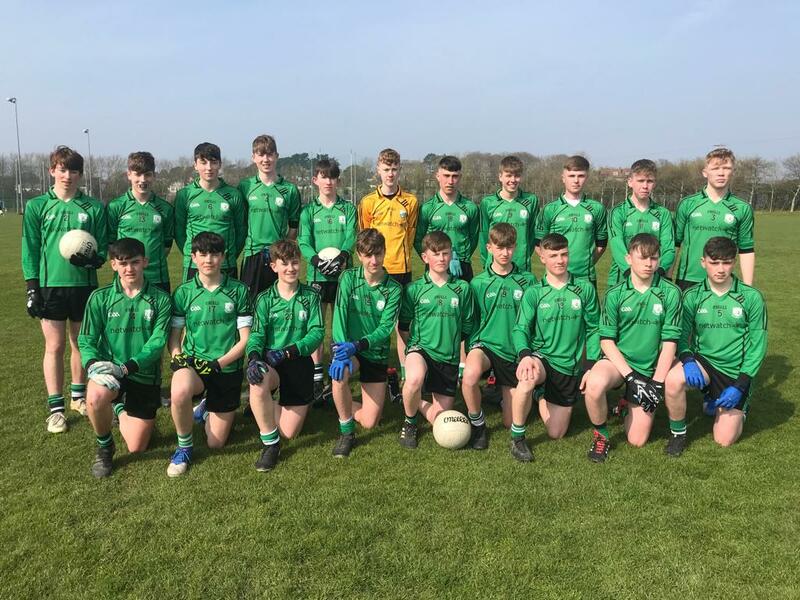 Squad – Adam Gilmore, Neil O’Leary, Aidan Sheary, Cillian Morrissey, Rian Carey, Jamie Lavin, Sean Quigley, Jack O’Donnell, Sam Noctor, Tony Mulqueen, Jack Lawlor, Matthew Coogan, Brendan Kavanagh, Adam Whyte, Samuel Keogh, Ryan Lynch, James Finn, Rheece Lamphiere, Ciaran Scully, Sean Harkness. In the U-16 Football Division 5 league, Lucan lost out narrowly to St. Peters on a score line of 1-10 to 1-08. 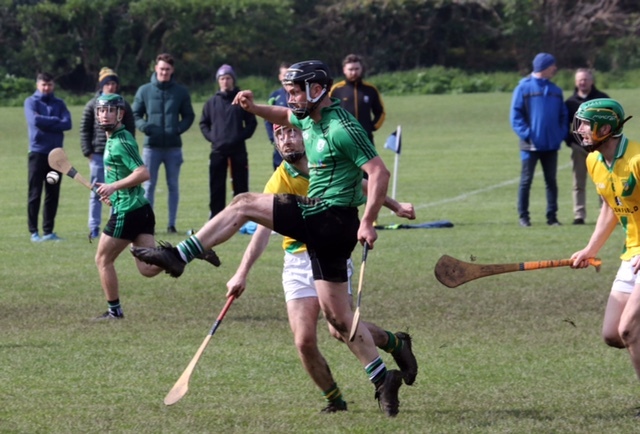 It was opening round Championship week-end for Lucan’s 3 adult hurling teams and while all three put in good performances, the results were mixed. The seniors started the week-end with a heart breaking 1 point loss to last year’s Champions Ballyboden on Saturday evening. The Junior As took up the baton on Sunday morning and went 1 step better, snatching a draw away to Faughs. It was then left to the Junior B’s to try and secure the only win of the weekend on Sunday afternoon which they duly did against the Wild Geese at the 12th Lock. See match reports below. Lucan seniors were very unfortunate to lose out by a point to reigning champions Ballyboden in this opening round senior championship contest. Lucan started the game very well and got the opening score through a long range Seanie McClelland effort. Boden broke through for a goal in the 3rd minute but, despite this setback, Lucan continued to press and some great scores from Chris Crummey soon had Lucan in front again, a lead they held until the dying minutes. Boden had a man sent off after 8 minutes and Lucan used the numerical advantage to good effect for the remainder of the first half. They played with high intensity and impressive work-rate to frustrate the Champions, and held a deserved 1 point lead at half time. Ballyboden regrouped at the break and managed to negate both the threat of Crummey and the extra-man advantage in the second period. Despite a lot of stoppages, the game was played with high intensity with both sides giving their all. Donal Flannery broke though the Boden defence for a brilliant goal in the 9th minute of the second half to give Lucan a 4 point lead. However, Boden never panicked and chipped away to get 4 of the next 5 scores with their experienced heads coming to the fore. Points from Ciaran Dowling and a Flannery free had Lucan 2 ahead coming in the dying minutes. However, Boden finished the stronger, and were level by the 59th minute and snatched the winner in injury time. Lucan were left bitterly disappointed and had deserved at least a draw for their efforts. However, it was their best display of the season to date and shows they are on upward trajectory. Paul Rigney and Sean McClelland were very prominent in defence, while upfront Chris Crummey, Kevin Fitzgerald and Ben Coffey put in very good performances, while Donal Flannery took his goal chance superbly. Lucan Team/scorers: D O’Neill, P Rigney, J Bellew, P Claffey, P Kelly, M McCaffrey, S McClelland (0-1), J McCaffrey, R Smith, R Ward (0-1), C Crummey (0-4), B Coffey (0-1), D Flannery (1-5, 0-5f), K Fitzgerald, P Crummey (0-1). Subs introduced: C Dowling (0-1), CJ Smith, C McHugh. A strong finish from Lucan Junior A’s secured a point from this hard fought battle against hosts Faughs in difficult underfoot conditions in Tymon Park. Faughs lead most of the way and looked the better team for much of the contest, but Lucan kept in the game and two second half goals ensured a share of the spoils. The early exchanges were even enough but Faughs began to exert a tentative dominance, helped by a well taken goal mid-way through the first half. Oisin O’Brien (2 frees), Rob Twomey and Rory Stapleton had early scores for Lucan to keep in touch. David Kavangh went close with two kicked goal efforts before points from Rob Lambert and Paddy Kennedy before half-time left 4 between the sides at the break, Faughs 1-7 Lucan 0-6. Scores were difficult to come by for both teams in the second half. A Rory Stapleton free was quickly cancelled out by a Faughs reply. Lucan then made a significant break-through when Paddy Kennedy pulled on a loose ball to finish to the net and reduce the margin to just a point. Faughs responded and stretched the lead again to 4 points and looked on course for victory. Lucan introduced some fresh legs which made a difference and they finished the game strongly. A short period of relative dominance was rewarded with a second goal when Fintan Clandillon flicked a high deliver to the net. Another free from Rory Stapleton levelled the game with 4 minutes remaining. Both sides had chances to win it but ultimately had to settle for a draw as time ran out. Lucan will be happy enough to come away with a draw having being playing catch-up for most of the game, and will see plenty room for improvement in future rounds. Tiernan Swords and Podge O’Connor were very solid in the Lucan defence while upfront Rory Stapleton, Rob Lambert and Paddy Kennedy gave the Faughs backs most trouble. Lucan Team/Scorers: K Roche, A Lee, T Clandillon, T Swords, P O’Connor, B Aird, E O’Connor, J Byrne, R Twomey(0-1), A McNulty, R Lambert (0-1), O O’Brien (0-2f), D Kavanagh, P Kennedy (1-1), Rory Stapleton (0-3, 0-2f). Subs introduced: E Connolly, E Kenny, F Clandillon (1-0), C Hogan. JDHC: Lucan Sarsfields 2-15 Wild Geese 3-7. Lucan’s Junior B’s had a good opening round championship win over Wild Geese at the 12th Lock. Lucan started well despite playing into an unusual north-east breeze, and had some good early scores from the impressive Evan Lombard and Ciaran Keane (frees). A well finished goal from Shane Donohue opened a significant gap. Lucan looked like they had taken a further decisive step soon after when Aidan Glover finished to the net after a Ciaran Keane penalty was saved, only for the goal to be disallowed. The Geese then broke up field after a wayward Lucan free and goaled to reduce the gap to just 2 points. They quickly followed up with some scores from fees and the sides were level at half-time, at 1-6 each. Lucan introduced Alan Murphy for the second half and he made a significant difference with some incisive runs at the Geese defence, drawing frees which Keane duly converted, as Lucan stretched the lead to 5 points. A flurry of goals followed, two from the Geese and one for Lucan expertly dispatched by Alan Murphy. This left Lucan a point ahead coming into the closing stages, and they added on a few more through Lombard, Keane, Murphy and Donohue to win relatively comfortably in the end. Lucan’s defence was solid throughout but will be disappointed at the concession of 3 goals. The outstanding performers on the day were in the forward line where Evan Lombard and Alan Murphy tormented the visiting defence with some great runs, and Ciaran Keane was reliable from placed balls. Lucan team/scorers: L Finnerty, S Stapleton, J Cavanagh, S Farrell, J Mullins, P Fagan, I Fitzgerald, A Finnerty, D Ryan, K Boylan, E Lombard (0-4), C Keane (0-7, 0-5f, 0-2 ’65), S Donohue (1-1), A Glover (0-1), D Reid. Subs introduced; J O’Connor, A Murphy (1-2), L Murphy, C Byrne, P Keane. Our U8 girls played their first home football match on Sunday morning. Once again we had big numbers and were able to field 5 teams of 7. The girls played with great spirit and were given great encouragement from parents of both sides. Special thanks to Tom Casserly who stepped in as a 4th referee. Tom was delighted to be involved as his granddaughter, Maisy, is one of our U8 girls. The Under 9's played away today against Na Fianna. The three teams all played brilliantly. There was some great scoring, brilliant teamwork, and superb tackling on show by the girls today. Well done to all the girls. The U10 girls football team played at home against Ballinteer St Johns. The girls again showed great team spirit with all girls activity getting involved in the games. There was very good link play on show which resulted in scores generated from team work. Due to the Leinster Championship match involving Dublin the previous day, this fixture was moved to Monday evening, with the throw in set for 6:30pm on AGP0. The forecast was not promising, but the sky looked clear enough as referee David Murphy threw the ball up a few minutes later than expected. Two minutes into the game and both teams opened their accounts; with Sophie Smith for Lucan, playing up the hill into the Weston Hockey end. For the next fifteen minutes, the two sides battled hard and could not be separated, five points each with the Sarsfields scores coming from Sadhbh Murray and Carah McLoughlin from play and Ellen Lyons twice - from a free and from play. FoxCab were terrific at getting almost all of their players behind the ball inside their own half, and then surging forwards on the break with support on either side. This paid off for them as they netted three times with just five minutes to the break, one of them just above goalkeeper Emma McGivney’s outstretched hands with her tiptoes at the bottom of the dip in the ground underneath the crossbar. Sarsfields responded with a cracking goal from Mia Dunne and an Ellen Lyons pointed free to go in at half-time five points down. As it was the first game since the clocks went forward, it seem that the elements were against everyone: the skies darkened and with fading light, the heavens opened up with a vengeance, and within seconds all were soaked through. The ball was thrown up to get things started, and with the wind at their backs, Lucan attacked, and despite another FoxCab goal, started eating into the southside ladies lead with a goal from Aoife Seery and points each from Ellen Lyons (free) and Phoebe Shannon, getting within a score. As the evening turned into night, Lucan continued to pile on the pressure; they hit the crossbar; they hit the upright twice; they forced a 45; but, they could not convert all the effort into scores. Eventually, the Cabinteely side recovered their composure and broke successfully three more times to put the game two scores beyond reach for the girls in green as the final whistle sounded and the rain abated, leaving the Lucan helpers to take down the nets and flags; assisted by the floodlights of the nearby hockey pitch. Lucan Ladies Minor A’s began their 2019 league campaign with a sixteen goal thriller, home to Castleknock on a mild Wednesday evening under lights at the 12th Lock, but it was the visitors who got off to a flying start with a goal and a point inside the first few minutes, who then converted a penalty to make it 2-01 to no score with six minutes on the clock. The away team kept the attack going, but hit the ball left and wide, allowing the Lucan keeper to send the ball quickly downfield where it was netted. Sarsfields applied the pressure and were rewarded with three quick points, reducing the deficit to just a point. Castleknock retaliated with another fine point and another goal from play. Into the second quarter and two wides by Lucan were followed by a point. Two minutes later Castleknock charged again and took a point followed by a quick goal. Again Sars responded with a point but it was the red team who finished the half stronger adding to their tally with two more points and a goal just before the break. Half time: Lucan Sarsfields 1-05 (8), 6-04 (22) Castleknock. With half an hour to play and 12 points down it didn’t look hopeful for the home side, as both teams traded scores inside the first two minutes: a point for Lucan and another goal for Castleknock; The home mentors made changes, and it was Lucan who pressed forward and blitzed their opponents with four goals and two points, with some great teamplay at the front, Castleknock tried to keep the momentum going, managing a solitary point in the middle of the second half. Sarsfields were only three points behind and as if they could smell blood launched an onslaught grabbing two more goals and two more points, but it wasn’t over yet, Castleknock responded with a point and a goal to leave a point in it with minutes remaining. The hosts fought on and took another goal in injury time and a final point just before the final whistle to complete a remarkable turnaround, finishing five points ahead, with a final score of Lucan Sarsfields 8-12, Castleknock 8-7.